We’ve all heard the adage “no pain no gain”, especially by overly keen trainers trying to push their clients beyond the point of exhaustion. I get it, it’s necessary to blast through the confides of your comfort zone as you strive to become the biggest, fastest and/or strongest person in your gym, fitness class or social training group. However, I would like to explain to you the importance of knowing how to differentiate between discomfort and pain. It’s a very fine line you walk if you’re venturing into pain territory, which I liken to walking a tightrope over shark-infested waters, where one wrong move can leave you in a place you’d rather not be in. There’s no real way for me to define discomfort nor pain, as everyone experiences different sensations when they’re physically exerting themselves. So, I’ve decided to keep it simple. A good sense of body awareness is the difference between physical longevity, and a recurring set of medium to long-term injuries that detract from your physical well-being. Now, let me elaborate through the use of examples. Picture that you’re doing sprints. No, not chronic cardio; I’m talking about the kind that gives you the same results for a fraction of the time. You’ve reached the end of your session. Your calves are burning, you’re breathing heavily and you can barely walk. It hurts, and it’s definitely not pleasant. You may even get a cramp due to the build up of metabolic by-products, which is definitely uncomfortable and painful. But… this pain subsides after a short time and will not pose any long-term consequences to you. The next day, especially if sprinting is not something you do often, you will struggle to walk. This is due to delayed onset muscle soreness from your session, not debilitating pain. Several days later, you decide that you’ve had enough of doing sprints and venture into the gym with your buddies. 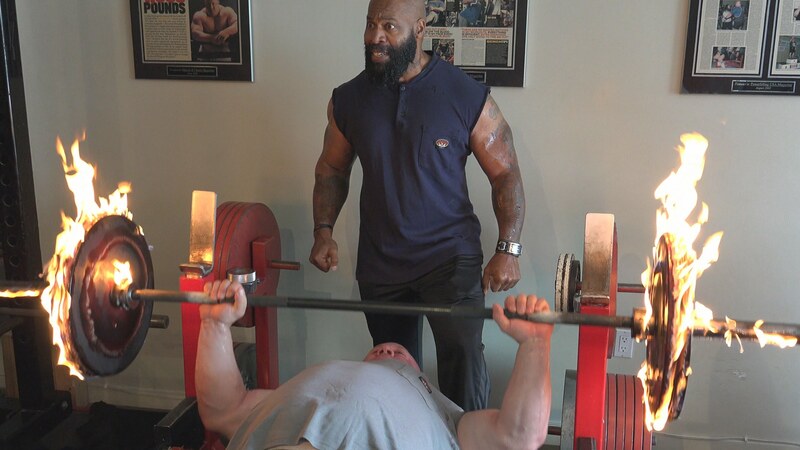 As a collective, you all congregate around the few available benches and begin with the bench press. Your session heats up, as each of you begin to pack on more and more plates in an attempt to be the king of the iron jungle. You’re now working at a weight you feel uneasy about attempting, but, of course you’d rather not look weak in front of your friends, so you decide to give it a shot. After several repetitions, you feel a slight tearing sensation in one of your shoulders and begin to experience a strange sensation in your arm. Not wanting to show signs of struggle, you push past this pain and complete your working set, despite your body telling you to stop. The next day, you struggle to raise your arm above your head, but you decide that it was caused by simply being sore after the challenging session. Over time, this feeling does not go away and actually intensifies as you continue to perform shoulder exercises. You become concerned, and look up your symptoms. Lo and behold, you’ve been hit with a rotator cuff injury, requiring a substantial amount of rehabilitation and strengthening before you can get back to training heavy once more. Ever since 2004 (or 2006 if you’re in Australia), we’ve been exposed to a television show called The Biggest Loser. The premise of this show is focused around incentivizing weight loss through competition and prize money, and radically distorts the activity of “exercise” for the general untrained public. Part of the show’s “appeal” involves watching the obese contestants push themselves through grueling sessions, and often, due to their size, frequent pain. No pain, no gain? How about pain, and definitely no gain? Seems more apt. The weight loss process as seen on television has distorted the understanding of what it takes to make a lasting physical change. The sooner we move away from the old notion of going from zero to tentatively walking the pain tightrope, the better. It’s not all bad, though. I believe we’re heading in the right direction when a reputable publication such as TIME publishes findings about The Biggest Loser, and how its contestants are prone to gaining back their hard-earned kilos despite the massive difference they’ve painstakingly made on the scales. You should not need to endure pain to get physical results. With that being said, I’ll take this opportunity to throw in a caveat. As you move from beginner to intermediate, and especially from intermediate to advanced, the likelihood of injury increases. Heavier weights, increased volume, age, and even added sessions can all be contributing factors. Sometimes, even freak accidents combined with good ol’ fashioned bad luck can occur. Check out Daniel’s wrist injury video below for an example of how bad luck (and a touch of complacency) turned an innocuous bar re-racking into an injury. With that being said, I believe it’s very rare for someone with over 5+ years of gym or sports training experience (at a high intensity) to have never experienced an injury; minor or major. If you haven’t, you’re either extremely vigilant with your recovery, or you’re simply not training hard enough. Sometimes an injury will be immediately obvious, and sometimes it can become apparent over time. As an example, think about breaking a bone. In most cases, this can be immediately obvious to you and even others around you. The slow process of tendon inflammation on the other hand, may take some time to become obvious. Again, I can’t stress the importance of body awareness strongly enough. We all have one body, and it’s up to you to care for yours – because at the end of the day, no one else will. Readers, what’s your experience with pushing through pain? What advice you would give to your past-self and those who have yet to experience an injury?